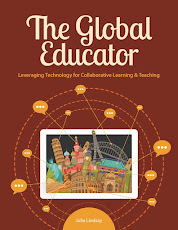 The Global Educator: Global Youth Debates - Live Finals! 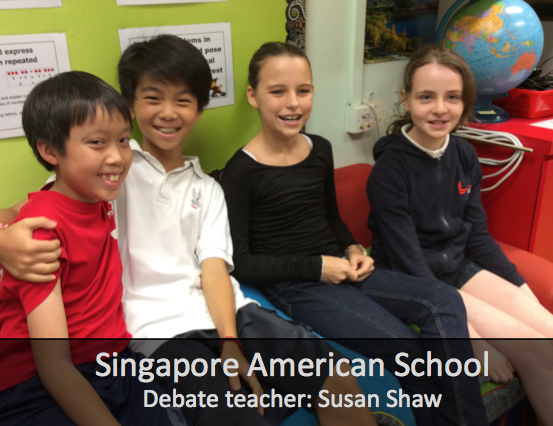 The final debates for our year-long global debate project took place today. Previous debates involved asynchronous responses using Voicethread as a communication portal. The final debates were complete LIVE in a Blackboard Collaborate. 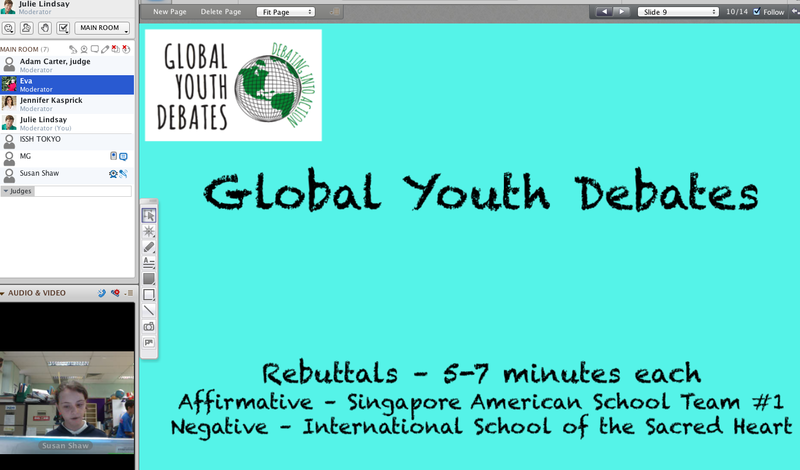 Global Youth Debates is an exciting global project that attracts debating teams from schools in many countries. Congratulations to both Hamilton Middle School, Denver USA Team #4 and Singapore American School Team #2 for debating in the 'Play it Again' live final. 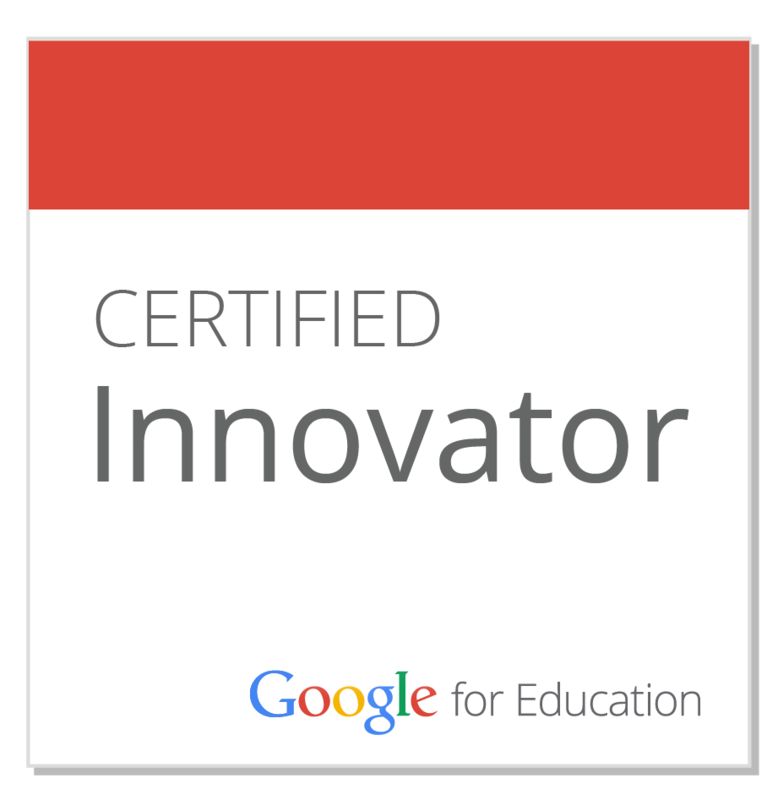 Thank you to teachers Lesley Meyers and Susan Shaw. Thanks also to Adam Carter for leading the judging and to Eva Brown for moderation and management. 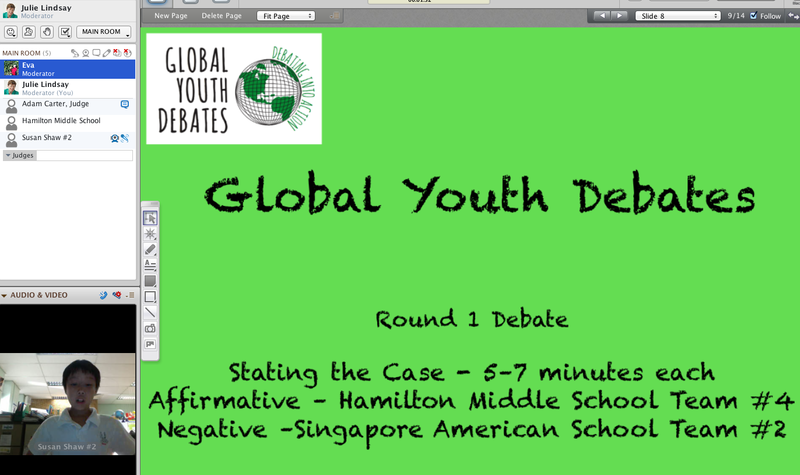 Our two best teams, and winners in the semi-finals this semester, debated in the Global Youth Debates Final Debate in Blackboard Collaborate. 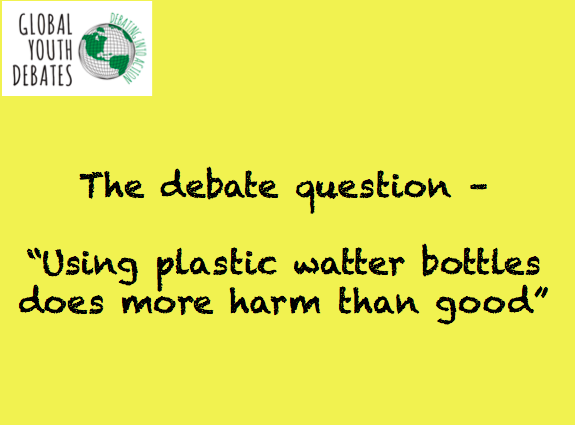 Singapore American School Team #1 and International School of the Sacred Heart, Japan debated live and shared great insight into the topic, "Using plastic water bottles does more harm than good." 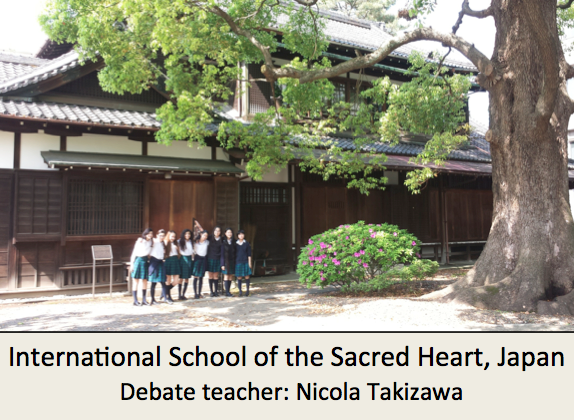 Thank you to teachers Nicola Takizawa and Susan Shaw. Thanks also to Adam Carter for and Jennifer Kasprick for judging and to Eva Brown for moderation and management. Come and join us! - new project starting in September 2014! 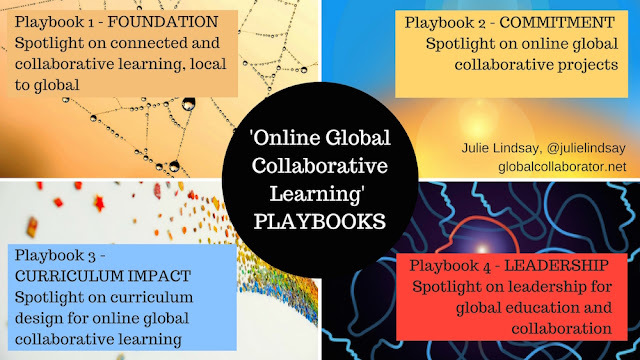 We are looking for schools who want to develop global awareness and global competence through authentic global collaborative experiences embedded into curricular and extra-curricular designs. 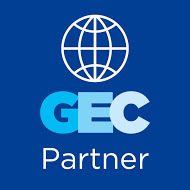 You can find full details on the Global Youth Debates website, read more about the Global Youth Debates structure and Apply now! 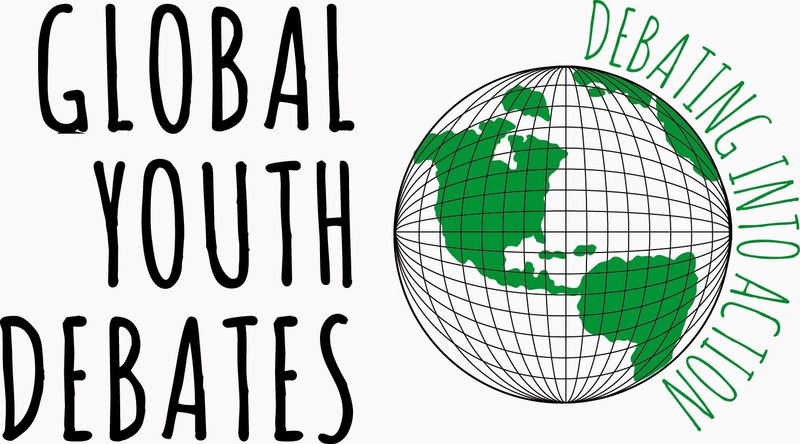 Follow @debateglobal Like our Global Youth Debates Facebook page. 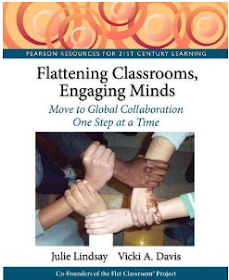 Read more about global collaborative projects students from K-12 can join!